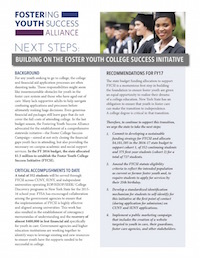 "Bridging the Gap: From Foster Care to College Success in New York"
The Fostering Youth Success Alliance presents the specific components of an initiative to directly address the major challenges that stand in the way of foster youth succeeding in college. Learning from the examples of other states, as well as programs here in New York, the Alliance developed a proposal that will enable foster youth in New York to obtain the necessary financial aid and supportive services they need to increase their rates of college enrollment, retention, and graduation. Fostering Youth Success Alliance, February 2015. 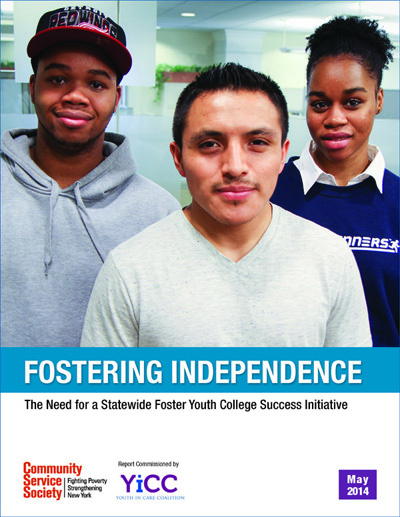 This reports presents the need for New York to develop and implement a comprehensive state-wide college scholarship program for youth in and aging out of foster care. L. Treschan & A. Mehrotra. Community Service Society, May 2014. 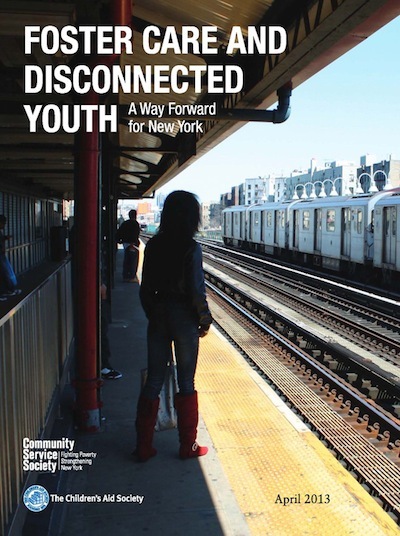 This report highlights and recommends policy directions and discusses successful program models that address the many challenges facing youth aging-out and youth who become disconnected. D. Mastin, S. Metzger & J. Golden. The Children’s Aid Society, and Community Service Society, April 2013. A summary of what the alliance has accomplished so far and what’s possible with additional funding from the New York State government.